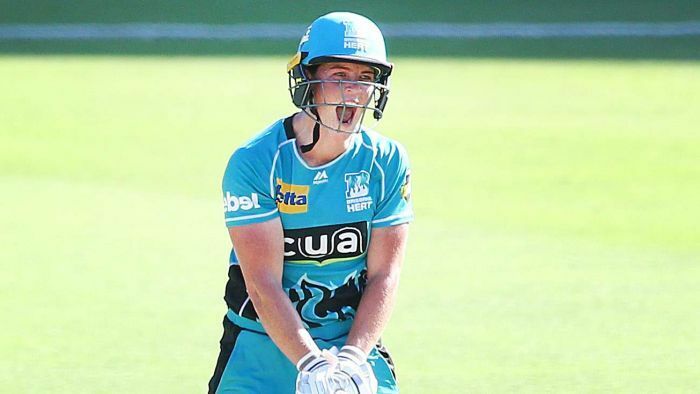 A breathtaking century from just 42 deliveries by Grace Harris has catapulted Brisbane Heat to a 10-wicket WBBL win over Melbourne Stars at the Gabba. Harris thrashed an unbeaten 101 off 42 balls, the fastest ton in WBBL history. She hit the winning runs with a straight six, as Brisbane cruised to 0-138 in just the 11th over. The opener bludgeoned a staggering 13 fours and six sixes. Harris’s devastating knock comfortably eclipsed Ash Gardner’s old mark for the fastest WBBL ton, which was off 47 balls last summer for the Sydney Sixers. She also becomes the first batter in WBBL history to notch two tons following her 103 against the Sixers in December 2015. Heat opener Beth Mooney was not out 28 after the watching the fireworks from the other end. After the Stars won the toss and made 7-132, Harris came out swinging. She reached her half century in just 23 balls with 11 fours. Harris was dropped on 92 by Erin Osborne off Angela Reakes, who went for 24 off her sole over. The crushing victory marked consecutive wins for Brisbane, which moved to a 3-2 season tally, while the Stars faltered to 3-3. Earlier, Heat left-arm spinner Jess Jonassen (3-17) helped restrict the Stars to 7-132 off their 20 overs. Jonassen struck with just her fourth ball, dismissing Lizelle Lee for 1 before the Stars recovered and appeared to be cruising at 1-50. But Jonassen helped apply the brakes with Sammy-Jo Johnson (2-30) as the visitors lost steady wickets after top scorer Reakes fell for a run-a-ball 30, which included four fours. Opener Reakes shared a 47-run second wicket stand with Katie Mack (26 off 34). But the Stars could never break the shackles despite contributions from South African import Mignon du Preez (23 off 13) and Osborne (18 off 12, including three fours). Du Preez hit the Stars’ sole six of the innings in the 16th over.